The Pleiades are a prominent sight in winter in the Northern Hemisphere and in summer in the Southern Hemisphere, and have been known since antiquity to cultures all around the world, including the Māori (who call them Matariki) and Australian Aborigines, the Persians (who called them Parveen/parvin and Sorayya), the Chinese, the Maya (who called them Tzab-ek), the Aztec (Tianquiztli), and the Sioux of North America. The Babylonian star catalogues name them MUL.MUL or "star of stars", and they head the list of stars along the ecliptic, reflecting the fact that they were close to the point of vernal equinox around the 23rd century BC. Some Greek astronomers considered them to be a distinct constellation, and they are mentioned by Hesiod, and in Homer's Iliad and Odyssey. They are also mentioned three times in the Bible (Job 9:9 and 38:31, as well as Amos 5:8). The Pleiades (Krittika) are particularly revered in Hindu mythology as the six mothers of the war god Skanda, who developed six faces, one for each of them. 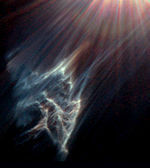 Some scholars of Islam suggested that the Pleiades (Al thuraiya) are the Star in Najm which is mentioned in the Quran. Charles Messier measured the position of the cluster and included it as M45 in his catalogue of comet-like objects, published in 1771. 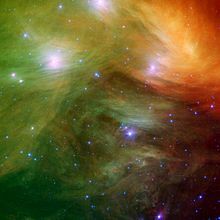 Along with the Orion Nebula and the Praesepe cluster, Messier's inclusion of the Pleiades has been noted as curious, as most of Messier's objects were much fainter and more easily confused with comets—something which seems scarcely possible for the Pleiades. One possibility is that Messier simply wanted to have a larger catalogue than his scientific rival Lacaille, whose 1755 catalogue contained 42 objects, and so he added some bright, well-known objects to boost his list. Results prior to the launch of the Hipparcos satellite generally found that the Pleiades were about 135 parsecs away from Earth. Hipparcos caused consternation among astronomers by finding a distance of only 118 parsecs by measuring the parallax of stars in the cluster—a technique which should yield the most direct and accurate results. Later work has consistently found that the Hipparcos distance measurement for the Pleiades was in error, but it is not yet known why the error occurred. The distance to the Pleiades is currently thought to be the higher value of about 135 parsecs (roughly 440 light years). The cluster core radius is about eight light-years and tidal radius is about 43 light years. The cluster contains over 1,000 statistically confirmed members, although this figure excludes unresolved binary stars. It is dominated by young, hot blue stars, up to 14 of which can be seen with the naked eye depending on local observing conditions. The arrangement of the brightest stars is somewhat similar to Ursa Major and Ursa Minor. The total mass contained in the cluster is estimated to be about 800 solar masses. Ages for star clusters can be estimated by comparing the Hertzsprung-Russell diagram for the cluster with theoretical models of stellar evolution, and using this technique, ages for the Pleiades of between 75 and 150 million years have been estimated. The spread in estimated ages is a result of uncertainties in stellar evolution models. In particular, models including a phenomenon known as convective overshoot, in which a convective zone within a star penetrates an otherwise non-convective zone, result in higher apparent ages. Another way of estimating the age of the cluster is by looking at the lowest-mass objects. In normal main sequence stars, lithium is rapidly destroyed in nuclear fusion reactions, but brown dwarfs can retain their lithium. Due to lithium's very low ignition temperature of 2.5 million kelvins, the highest-mass brown dwarfs will burn it eventually, and so determining the highest mass of brown dwarfs still containing lithium in the cluster can give an idea of its age. Applying this technique to the Pleiades gives an age of about 115 million years. The cluster's relative motion will eventually lead it to be located, as seen from Earth many millennia in the future, passing below the feet of what is currently the constellation of Orion. Also, like most open clusters, the Pleiades will not stay gravitationally bound forever, as some component stars will be ejected after close encounters and others will be stripped by tidal gravitational fields. Calculations suggest that the cluster will take about 250 million years to disperse, with gravitational interactions with giant molecular clouds and the spiral arms of our galaxy also hastening its demise. ↑ a b c d "SIMBAD Astronomical Database". Results for M45. http://simbad.u-strasbg.fr/Simbad. Retrieved 2007-04-20. This page was last edited on 2 April 2018, at 03:44.